When I clean house, I clean house! That means I will throw out or donate anything I haven’t touched in months or deemed useless. I just don’t see the point in hoarding items that other people can use. Once every couple years I’ll hold a yard sale if I’ve accumulated items that I feel I can get a few bucks out of. But even the months leading up to the yard sale can be a bit painful for me because I hate walking into my garage and seeing bags and bags of things I have no use for. It takes everything in me to keep from loading it into my van and hauling it down to the nearest goodwill…LOL! BUT I will say that with some creativity and patience you can turn trash into treasure or in this particular case, into a fun DIY craft project. 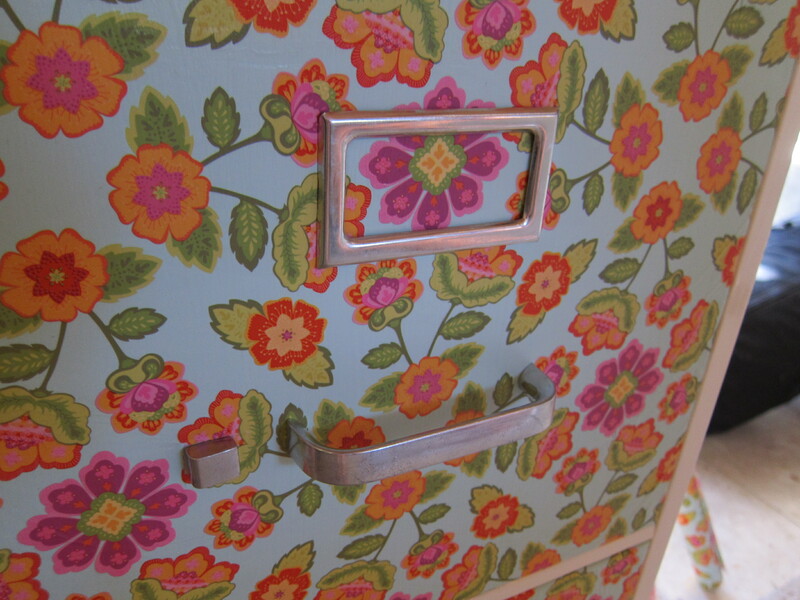 For instance, a few months back I was in need of a file cabinet so I could store all my card making and sewing supplies and important documents. So I posted a status on my Facebook wall asking if any of my friends had an old file cabinet they didn’t need. Didn’t feel like paying for a new one if I could find one for free. After all, who doesn’t want free stuff? right? A family member responded and said he had not one but two cabinets that he didn’t need so hubby and I went to pick them up. I admit they sat in my garage for a couple of months before I delved into a time consuming project to rejuvenate them. Below is a before and after picture. I’m sorry I should have taken more pictures with step by step instructions of the whole process. I did include instructions below at the end of this post. Hope you find the steps easy to follow. Feel free to leave a comment or contact me if you have any questions. Step 1 – Run a damp cloth all around the surface of the cabinet. Clean out the insides cabinets really good too even though you won’t be painting in there. Then remove all the hardware (the handles and metal label holders). The thumb latch didn’t come off so I just left it alone. See the before picture. Step 2 – Sand all around the cabinets, top, sides, back and the trim around the drawers (you don’t need to sand the drawers). This is best done outside. Step 3 – Again clean the cabinet making sure that it’s free of any dust from the sanding. You want a nice smooth, clean surface before you start painting. Step 4 – Just so that I didn’t have to worry about the dogs or anything floating in the air that could possibly get in the paint, I decided to do the painting indoors. If you choose to do this, find a good spot in your house where you can spread out an old bed sheet or large painter’s plastic sheeting on the floor and secure in place with masking tape. This will help protect your floor. Open windows to allow air ventilation. 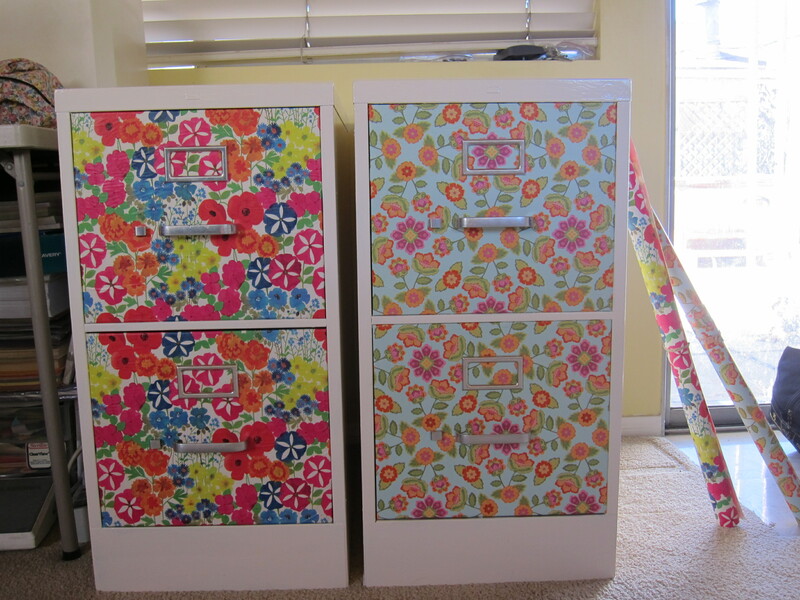 Step 5 – Open the drawers and adhere masking tape all around the edge of the drawers because you will not want to get paint on them. 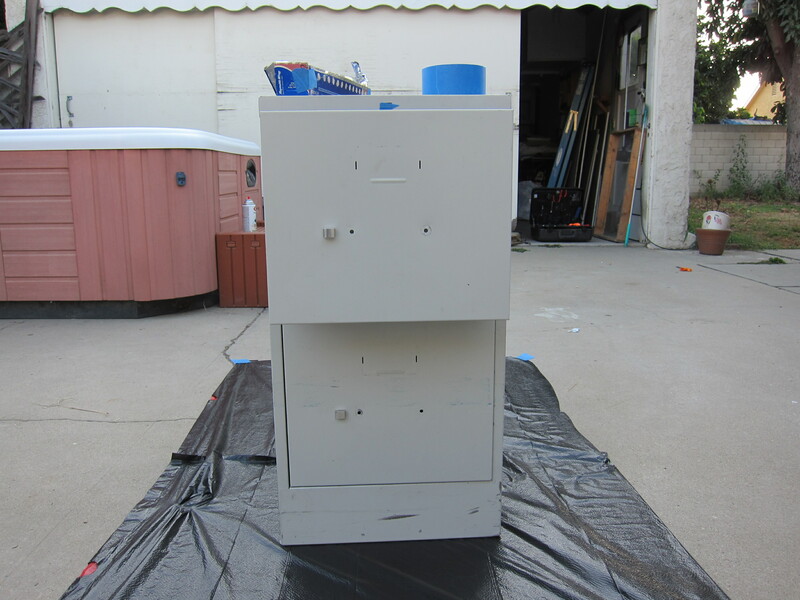 Step 6 – I know nothing about paint so I went to my nearest paint store and asked for the cheapest paint that I could find that could be used on metal surfaces. The guy recommended an acrylic latex semi-gloss paint. I grabbed a small can of 30.7 fl oz in the color I wanted. One can was more than enough for two cabinets. Start painting your cabinet. Let the first coat dry then after a few hours, apply a second coat. Let dry. You can determine if you want to go for a third coat. I just did two coats. I wanted to ensure that the cabinets were completely dry before beginning the next step so I let the final coat dry overnight. 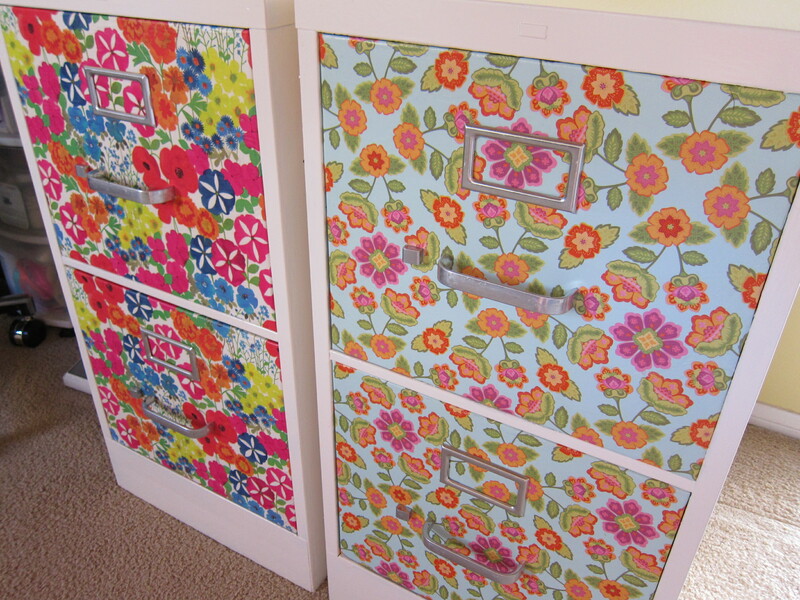 Step 7 – The next day – cut out the paper you want to use to cover your file cabinet drawers. I used wrapping paper but you can use scrapbooking paper if you like. You will need to take measurements so that you cut out the right size plus some extra. You should have about 1/2 inch extra margin so you will have enough to fold back. 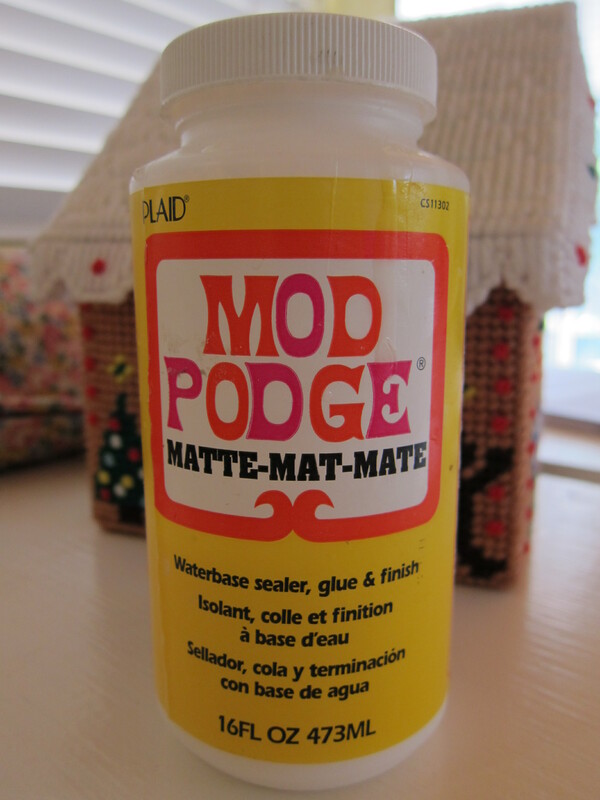 Step 8 – Here is a picture of the Mod Podge I use. It’s a sealer, glue and finish all in one and it’s awesome! You can get this from Michael’s or Joanns. It comes in a gloss finish but I prefer the matte. Grab your cut out paper and brush the back side of it with mod podge. 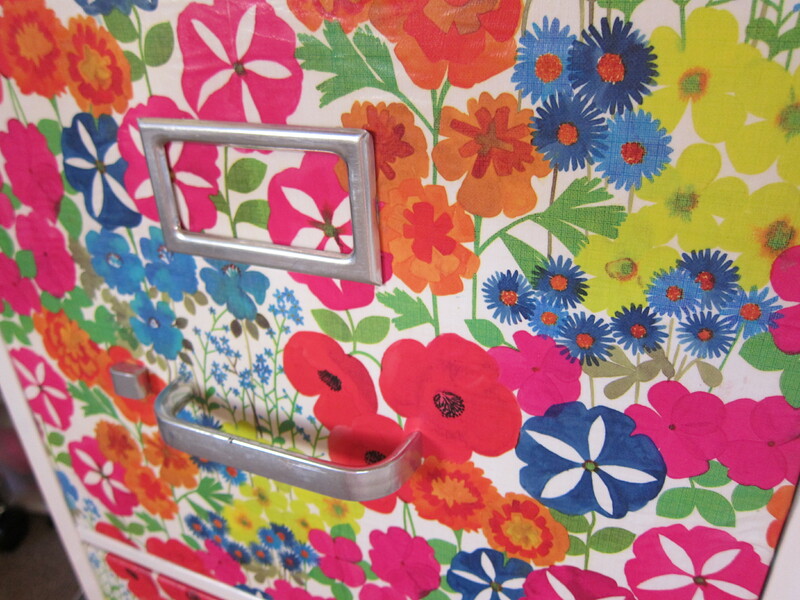 Or you can apply the mod podge directly onto the metal surface of the drawer. You must adhere the paper to the face of the drawer and position it as quickly as possible before the mod podge starts to dry. You will need to grab your Xacto knife and carefully cut around the thumb latch so that you can smooth out the rest of the paper with your hands. This will prevent wrinkling or bubbling of the paper. Some people will want to use a ruler or something flat to smooth out the paper. I tried this and didn’t like how it wrinkled my paper. So I used my hands. You may still have some slight wrinkling but not as bad. You should have about a 1/2 inch of excess paper on all sides of the front of the drawer. You will want to fold this paper back and smooth it out. Step 9 – With your Xacto knife gently and carefully cut through the small slots where the metal label holders go. Step 10 – I’m a very detailed person and like things to look nice and have a clean finish. When you have the drawers open, be sure to look around the inside along the sides where you folded the paper back and cut or trim the paper where ever needed so that it fits around any metal parts of the drawer. Step 11 – Once the mod podge has dried and you are happy with how you’ve adhered your paper to the drawers, you may now apply a single coat of mod podge over the paper to give it the sealed finished look. Let dry and apply another coat. Let dry completely before you attach the metal handles and label holders. I hope these instructions were helpful and that I haven’t scared you away with all the detailed steps I provided. I’m one of those people that likes to jump in and get things done quickly but I’ve learned from past experiences that the finished product will not always come out looking pretty if you rush without paying attention to detail. So just turn on your favorite music or put on your headphones, take your time and enjoy yourself. I promise you’ll be happy with the end result. Great stuff. I love projects like this. I’m actually doing the same for a client of mine but I’m using wall paper decal. Great job sprucing it up.